Despite its budget positioning, the A7000 does come with a good set of features, including a 5.5-inch HD display, 64-bit octa-core processor on a MediaTek chipset, 2GB RAM, 8 megapixel camera, LTE, dual SIM support and a 2900mAh battery. It’s also the world’s first phone to have Dolby Atmos-certified audio. The Lenovo A7000 looks pretty much identical to the A6000 and A6000 Plus, except it’s bigger. On the front is a 5.5-inch display under a nondescript glass. Below the display are the three capacitive buttons for back, home and multitasking. On the right are the volume and power keys that are perfectly placed and easy to use. On the top is the headphone jack and an unusually located microUSB port. On the back is the 8 megapixel camera lens with dual LED flash and the loudspeaker, which does get quieter when you place the phone on its back. Underneath the removable back cover is the removable battery, two micro SIM card slots and microSD card slot. The phone is a bit large, which might be a problem for some, but not something you can’t get used to. Build quality is good despite the all plastic construction although the design is quite dull, especially in black. The Lenovo A7000 has a 5.5-inch 1280×720 resolution display. The display is surprisingly good, with good enough sharpness and pleasant colors. Sunlight visibility and viewing angles are also adequate. The A7000 display thankfully does not have the terrible over-sharpening effect applied on the A6000 Plus. Overall, a very impressive display at this price point. The A7000 runs on a 64-bit MediaTek MT6752 SoC with octa-core Cortex-A53 CPU clocked at 1.7GHz and Mali-T760 GPU. There’s also 2GB of RAM and 8GB internal memory, of which around 5GB is available to the user. The lack of sufficient internal memory is a bit of a concern. Thankfully, there is a microSD card slot. The phone also supports 4G LTE support, along with Wi-Fi 802.11n, Bluetooth 4.0, and GPS. On the software side, the A7000 runs on Android 5.0 Lollipop with Lenovo’s Vibe UI on top. The UI has improved considerably over its KitKat counterpart on the A6000 and A6000 Plus but it’s still a bit of an eye sore, especially the icons, which look terrible. There is theme support but none of the themes are any better. With a bit of cleaning up you can make the UI palatable but it’s still not as good as one would like it to be. The performance on the A7000 exceeded expectations. The chipset used in the phone is quite powerful and blows the Snapdragon 410 used in other phones in this price range out of the water. The phone performs remarkably well, with exceptionally smooth scrolling and quick app launches. Even gaming was a piece of cake, with every game thrown at the phone working flawlessly. Thankfully the performance does not come at the cost of heating, and the phone remained at acceptable temperatures throughout usage. Network performance was also fine, with all connectivity features working as expected. Multimedia performance was decent. The display size and quality made it ideal to watch content on. The audio quality through headphones was also good. The Dolby Atmos feature simulates a surround sound effect that’s not particularly good and I preferred to keep it switched off. The loudspeaker, unfortunately, doesn’t sound that great nor is particularly loud. The A7000 has an 8 megapixel camera on the back and 5 megapixel camera on the front. The rear camera performance was a mixed bag, with decent image quality in daylight but less than ideal performance in low light. The camera is not on par with the likes of the Xiaomi Redmi 2 or the Honor 4x but mostly just passable overall. The A7000 has a capacious 2900mAh battery. Despite the powerful chipset, the battery life on the A7000 was quite decent, with 10-12 hours of battery life on a single charge with around 4 hours of on-screen time. 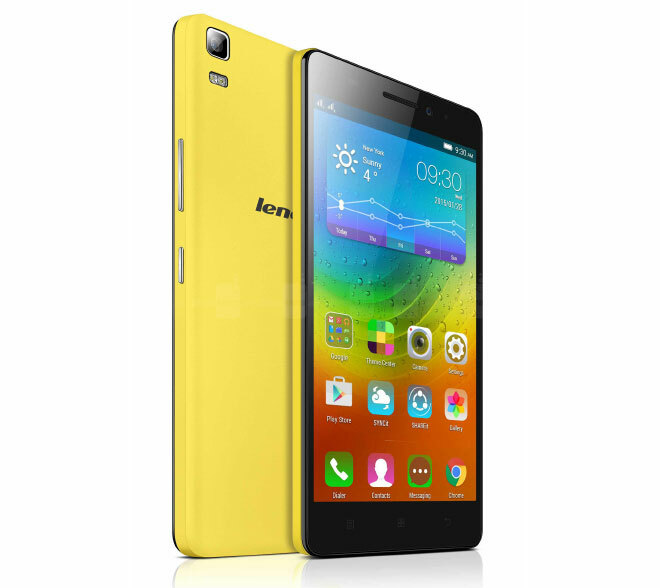 The Lenovo A7000 is priced at INR. 8,999 ($142) in India. That pegs it slightly above the likes of the A6000 Plus, Redmi 2, and Yuphoria. Having said that, the phone more than makes up for that by its performance, which is leagues ahead of any other phone in this price range, or even more expensive phones like the Xiaomi Mi 4i. The rest of the phone isn’t particularly special but if you value performance over everything else, this is the phone to buy.